1)Bihar =April 10,17,24,30 and May 7,12. A message on WhatsApp and other social media sites ‘lists’ the Declaration of 2019 Lok Sabha Election Dates all over India. The ‘Flash news’ claims to list the dates of Lok Sabha general elections to be held all over India. Amidst the major political parties preparing for the upcoming Lok Sabha elections in India, many readers thought the ‘flash news’ is true. The Indian Lok Sabha Election dates are however not declared as of this writing, so the message is a hoax. To begin with, the Election Commission of India has not announced the dates of Lok Sabha Elections, 2019. There is no credible news about such speculations also. 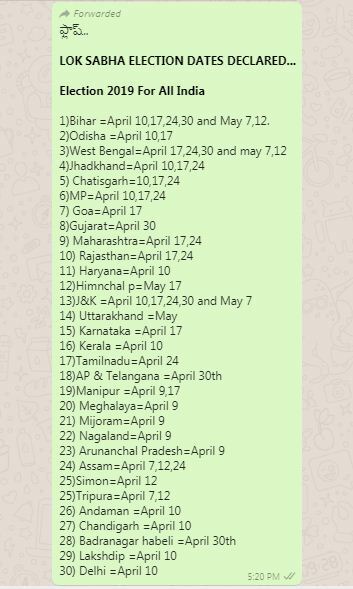 However, the message in circulation through WhatsApp forwards lists 30 places in India along with the alleged dates of elections. As a matter of fact, India has 29 States and 7 Union Territories. In the list in message, we see unfamiliar places called ‘Simon’ and ‘Badranagar habeli’. They are probably referring to Sikkim State and the Union Territory Dadra and Nagar Haveli. Moreover, the Indian states of Uttar Pradesh and Punjab are missing in the list, along with the Union Territories Puducherry (earlier Pondicherry) and Daman & Diu. All these flaws clearly indicate the message isn’t any official declaration of Lok Sabha election dates for India, 2019. The election dates in the message match closely to 2014 Indian general election (Lok Sabha polls) dates, as published on Zee India News website zeenews.india.com. Some prankster in fact copied the old dates, edited the content slightly and presented them as dates for upcoming Lok Sabha elections, 2019. Note, the hoax message can also appear online in different forms and dates.